Companies, concepts, people, names below are imaginary. Designs and layouts are made for your inspiration. If you like these examples, you can add them to your dashboard with one click. And use them as a starting point for your company. What would I use the fact sheet template for? 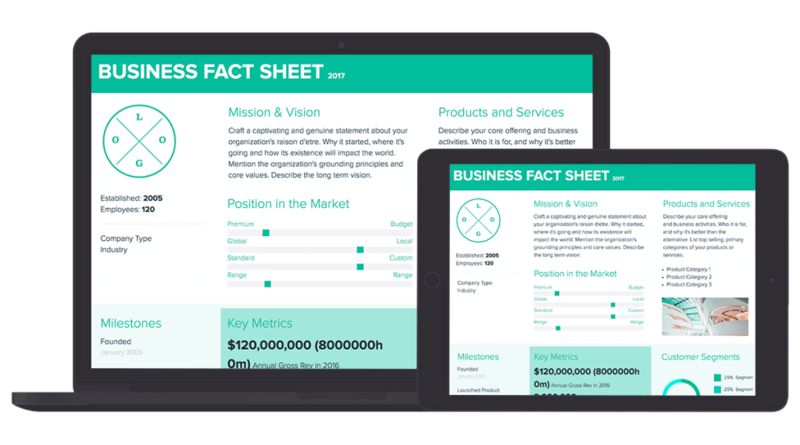 A strong fact sheet will present the most vital facts about your business on a single page. 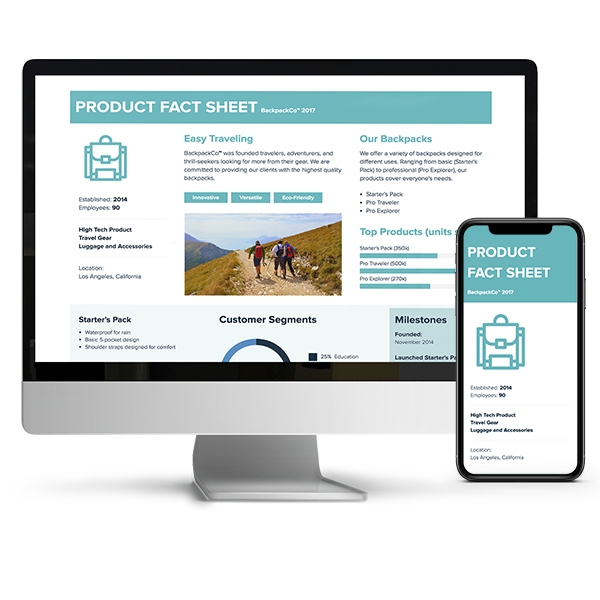 Use the fact sheet template to promote a product or service for sales teams, to introduce your startup to investors, or organize human resources or executive teams. You can even use the fact sheet as marketing collateral. Yes! We have a couple of fact sheet examples above that you can use as a starting point for your own. If you find a style you like, use it for your inspiration. Just click on one of the examples further up on this page to save it as a folio and start editing with your own content. What info do I need to create a fact sheet? This will depend on what you’re using the fact sheet for. One made for sales or marketing should focus on presenting straightforward product/service information to pique the audience’s interest. A fact sheet made for internal reporting should include analytics on business growth and other key metrics. Read our how-to guide for more tips. Can I add colleagues to edit my fact sheet? Yes! On the Business plan, you can invite as many people as you’d like to collaborate on your fact sheet, ensuring your whole team is aligned. Here’s more on real-time collaboration. How do I share my fact sheet? 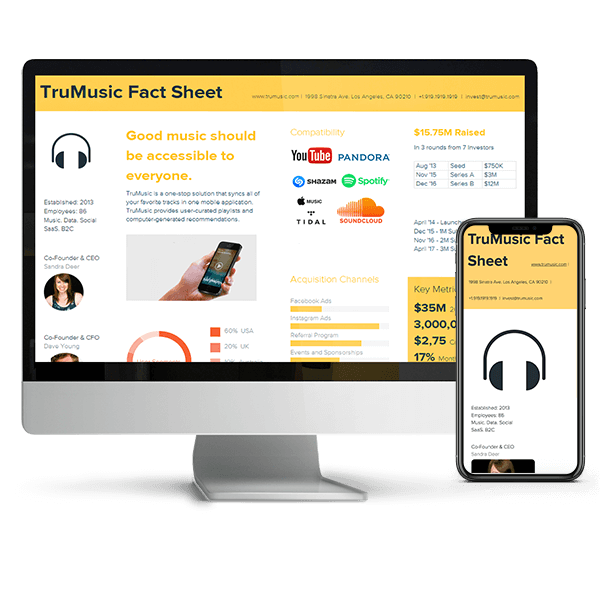 When you’re ready to share your fact sheet, choose between presenting it as a full-screen digital slideshow, sending it as a responsive web link or exporting your fact sheet as a PDF or PNG (premium feature). All of your share options are located at the top right of your edit screen. Learn more about the different ways to share your folios in this tutorial video. Do you have other tools for showcasing my business? We do! There are a number of different templates, examples and resources to guide you through the process of promoting your brand. Check out our Marketing toolbox and our Business Development toolbox to find more tools and resources.